It's been said that during the Industrial Revolution, most of the deadly sins were turned into virtues. Perhaps none so much as greed. But avaritia is more than just wanting stuff — it's wanting more than you need. (Dante called it "excessive love of money and power.") Hmmm... it looks like we may still be having trouble with this one. Erica Schoenberger has applied a scholar's scrutiny to American corporations and their management. 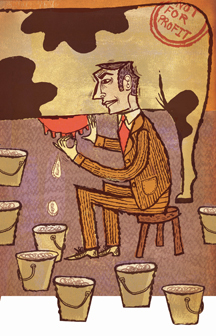 A professor of geography and environmental engineering at the Whiting School (and a member of the Anthropology faculty at the Krieger School), she chatted with writer Dale Keiger about avarice in the corporate realm. Where is the line between corporate management's fiduciary responsibility to generate profits and return on investment, and avarice? In the cold, hard world of competitive capitalism, if a corporation is behaving correctly, it makes profits and then reinvests in new technology, new markets, new ways of producing things, and new products to stay ahead of the competition. To do that successfully, it has to make at least the average rate of profit. Better is to make above that. Then it ought to be able to reinvest more and get even more competitive. But it's not so obvious that corporations do that. Look at the rates of return that corporations feel they have to predict before they will make an investment. Those rates are pretty high, like 20, 25 percent. That's way above the average rate of profit. So you really need to ask what's happening to the money. What is happening to the money? Corporations put a lot of money into fancy buildings and pay their chief executives staggering fortunes that seem to have no connection to motivation or incentive. If the corporation is making all these profits but throwing the money around in unproductive ways, that might be one way of separating legit profits from sheer greed. For a lot of corporations these days, even in the manufacturing sector, the cost of labor is a very low proportion of total manufacturing costs, and an even lower proportion of total sell costs. So when you have a corporation whose cost of labor is only 10, 15, 20 percent of total costs, and that corporation is still trolling the world for ultra-cheap labor, that's greedy. It doesn't need to find the cheapest labor on earth to make profits. That greed is easier to spot. I would say, based on my experience and thinking a lot about these guys — the occasional woman, but mostly guys — they don't see themselves as being greedy. They have a fabulous sense of entitlement. They think they create value just by existing in the world. Elsewhere in society, the whole discourse is against entitlements. Poor people aren't supposed to have entitlements, Social Security recipients aren't supposed to have entitlements, working class people aren't supposed to have entitlements, but the guys running the big corporations, they live on the very mountaintop of entitlements. They look down and they think, Boy, I'm smart. Even corporate executives in other countries are aghast at what American corporate leaders earn. The Germans and Japanese think we're nuts. Why are corporations willing to pay CEOs so much? One explanation is there is a market for CEOs, and [super compensation] is what's offered in that market. That explanation, which is the one offered by the highly paid chief executives themselves, doesn't work so well if you consider the nature of the market, which is not at all the perfectly competitive marketplace that Adam Smith had in mind. It's a fixed market. It works through networks, through headhunters who know CEOs who know board members. CEOs appoint the boards of directors who establish the compensation. The boards are obligated to the CEOs. There's a way in which I feel we've just collectively had the wool pulled over our eyes, that corporate leaders have managed to get everyone to believe that the people at the top of corporations are simply worth fabulous amounts of money because they exist. The degree of income skew in the United States right now is really remarkable, and there's no sort of ongoing critique of that. I think it's the world's most brilliant piece of PR that everyone seems to agree that these guys are worth it. Is there any justification for the credo, stated by Wall Street's Gordon Gecko, that greed is good? Hopkins undergraduates finish their four years, on average, with $14,000 in student loan debt. For many, the bill is much, much higher. So you'd think that students scoping out future careers would be angling for that job with the whopping starting salary, right? Think again, says Adrienne Alberts, director of the Johns Hopkins Career Center. "Salary is never, ever at the top" of the priority list for Hopkins student job hunters, Alberts says. "What we're hearing more from students is that quality of life is most important." Students want their weekends free to spend with friends and family, according to Alberts. They tend to look for "stable positions with the potential for long-term growth," and at organizations with "altruistic" philosophies. Times were decidedly different just a few years ago, during the high-tech boom, when Hopkins students could hope to land well-paying jobs in the technology or finance industries. "In 2000 and 2001 we were seeing exorbitant salaries, signing bonuses, and all kinds of perks," Alberts says. "One undergraduate left in 2001 to work for a technology company, starting at $73,000. That was the highest starting salary I'd ever seen. It made me lose my breath." Like the 1980s or the Gatsby era, the period soon after the American Revolution, perhaps surprisingly, was a time of high living. And in Baltimore, impetuous 18-year-old Betsy Patterson was in the midst of it. 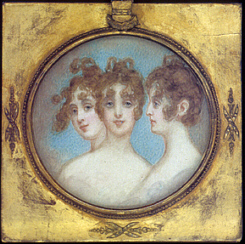 She was the pretty, strong-willed daughter of a rich Baltimore merchant, and she had just married French visitor Jerome Bonaparte, the handsome, curly-haired, slight, and slightly effeminate 19-year-old brother of Napoleon. Copy from original owned by the Maryland Historical Society. No reproduction without permission. Whether or not the young pair was "greedy" is hard to say, according to Catherine Rogers Arthur, curator at the Homewood House Museum, which houses some of Betsy's things and where she is "a tantalizing aside whose story never loses its allure." The couple would certainly draw paparazzi today with their extravagant tastes, however. In the end, it was greed that seems to have been their undoing. Jerome first admired Betsy's "fine profile and such harmonious proportions" on a horse ride, and, after a heated courtship, they married — causing a stir in each family and throughout a realigned world where post-revolution power structures were still shifting. Ignoring the stir, the two partied. Jerome spent money like water, according to the French consul forced to worry over meeting the young man's extravagant demands. The consul received notes such as this one, from one of Jerome's friends: "He has also asked me to tell you that he is impatiently awaiting the arrival of the $4,000 you are supposed to remit to him." "Too bad he leads such an idle life," the frustrated consul once muttered, according to a 1988 biography of Betsy, The Belle of Baltimore, by Claude Bourguignon-Frasseto. Among Bonaparte's presents to his young wife were fancy, sheer French dresses that, with nothing beneath them, revealed so much of Betsy that the pair often drew a crowd of male gawkers, which seemed to please them both. "Look here," Betsy told a critical aging aunt, according to her biographer, "that is what Jerome wants." The two got attention in the highest circles: "I am sure," said Vice President Aaron Burr, "that I could stuff all her dresses together into my pocket and mistake them for my handkerchiefs." Here on campus at the Homewood House are other reminders of that life — most notably Betsy's French-made traveling mahogany bidet, with its silver basin (signed by its designer) and its copper inlay and carved legs that fit neatly into the case. The glamorous life did not end happily. Napoleon threatened to disown Jerome and had the marriage annulled (though Betsy was pregnant). Three years after the two had reached the height of their celebrity, Betsy's powerful father brought her a letter describing Jerome's lavish wedding in 1807 to Princess Catherine of Wurttemberg, assuring his position of royalty. "A fine reward for a man who has abandoned his legitimate wife," the elder Patterson said. On June 11, the G8 industrialized nations voted to write off $40 billion in unpaid international debt owed by 18 of the poorest impoverished countries in Africa and Latin America. U.S. Treasury secretary John Snow called it "an achievement of historic proportions." N'Gandu Magande, finance minister of Zambia, one of the debtor nations designated for relief, said, "It is incredible. It sounds like a fairy tale." But much of the response to the G8's announcement was muted and cautious. Roger Leeds, director of the Nitze School of Advanced International Studies' Center for International Business and Public Policy, is among those who believe caution is warranted. "I'm not against debt relief in principle," he says. "I'm against relief where there is not a clear timetable for specific reforms on the part of both debtors and creditors. You have to have accountability and very tight controls. We've learned this over and over and over again." If the world's major lenders forgive so much accumulated debt in the absence of strict conditionality, Leeds says, that means there is insufficient accountability for corrupt or incompetent governments that have wrecked, and in some cases plundered, their nations' economies. "You're not setting very high standards for future leaders by turning your back on all that's happened previously," he argues. He adds that the recently announced debt relief also creates a "free rider" problem: "What you're doing here is rewarding the worst performers at the expense of those developing countries that have repaid their debts in full and on time." Leeds believes that it's not just the debtors who have been wayward. "All attention focuses on the debtors, very little on the behavior of the creditors, most of whom were the multilateral development institutions," he says. "If there are lessons to be learned from this whole experience, you have to have much more rigorous accountability of the creditors extending these loans. In my view, they have gotten off easy." Why have institutions such as the World Bank and the International Monetary Fund continued for decades to make loans to nations with such terrible records — even those exhibiting corruption of the upper reaches of government? In addressing evil in his Politics, Aristotle takes aim at people with 'internal disorders,' especially a category of rogues who reject justice, temperance, and the like, finding little value in these would-be virtues. These scoundrels seek to live in luxury and to dominate others but are also psychically unfulfilled, as their rapaciousness leaves them wanting ever more and more. 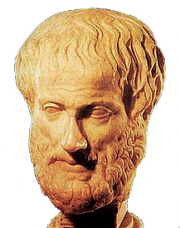 For Aristotle, they are bad people doing bad things in order to get what they want, with little regard for other individuals or wider society. In a word: villains." — From the foreword to the current issue of the SAIS Review of International Affairs, themed "Villainy." The issue focuses on "the murky world of extra-legal activities that go beyond the pale of acceptable behavior." Editors Maia Linask, Manolis Priniotakins, and Andreas Hipple have gathered a collection of essays that attempt to define "villainy," to explore how governments can respond to extra-legal activities in the international arena, and to offer case studies, including articles about piracy, small arms dealing, and the trafficking of weapons of mass destruction. Published twice a year at Hopkins' Nitze School of Advanced International Studies, the SAIS Review focuses on contemporary global issues in the areas of politics, economics, and security. For more information, visit www.saisreview.org. In a time not so long ago, the concept of working at a nonprofit and earning a big payday sort of went together like broccoli and ice cream. In recent years, however, the paychecks and perks proffered to those leading the nation's nonprofit entities — in particular hospital systems and the larger charitable organizations — have achieved a greater level of scrutiny. Gilbert Ford Is greed truly encroaching on the third sector? Lester Salamon, director of the Johns Hopkins Center for Civil Society Studies and a nationally recognized expert on the nonprofit world, says "not really," but the perception certainly is there. Fueling this perception, Salamon says, are media folk and lawmakers who have grabbed hold of the dubious actions of a handful of nonprofit executives and recent national scandals, such as the tale of Bill Aramony, the United Way head who was convicted of stealing from the organization. Pointing to stories of executives who may have misused their position and used organizational funds for personal purposes, Salamon says, "All of that stimulates a lot of scrutiny, but I would say that the practices are not rampant." The press, Salamon says, has also taken advantage of publicly available access to a nonprofit's annual financial reports. Heads often turn, Salamon says, when people see someone at a nonprofit, no matter how large, offered a high six-figure salary. "I think it's a bit of cheap shot, especially when you compare it to what the head of a large company such as a Black & Decker earns, which may be five times what the head of a university is paid," he says. "It's all a matter of expectations, what people feel someone at a nonprofit should make." While it's true that some nonprofit executives are earning larger salaries than in the past, it's often a natural product of the organization's growth, Salamon notes. Compared to a Ma and Pa soup kitchen of yesteryear, nonprofit organizations today can be complex businesses with thousands of employees and multiple funding streams. Consider the Metropolitan Museum of Art in New York, whose total revenues in 2004 were nearly $319 million. "Heading these organizations can be brutal jobs. The nonprofit world often can be much harder than working in the for-profit field, in fact, where there's a clear bottom line and only one or two sources of income," he says. The Center for Civil Society Studies engages in a wide variety of research activities designed to shed light on the role that nonprofit organizations play in modern society. A core venture of the center is the Comparative Nonprofit Sector Project, the largest inquiry ever undertaken into the scope, structure, financing, and impact of nonprofit activity throughout the world. Salamon says the center in 2002 amassed data on nonprofit wage levels and, as expected, found them in general to be significantly below the average wage in the for-profit arena: The average weekly wage of someone at a nonprofit was $603, compared to $670 at for-profit firms. However, when nonprofits in the education, day-care, and social services sectors were compared to their for-profit counterparts, average nonprofit wages typically exceeded average for-profit wages, by 30 percent (daycare) and 18 percent (residential care). 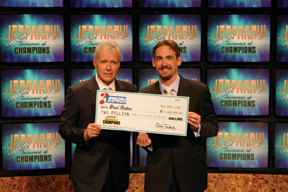 "I'll Bet It All, Alex"
Brad Rutter was just 24 when he became the first person ever to win $1 million on TV's Jeopardy back in May 2002. He was later topped by Ken Jennings, who took home $2 million. But Rutter, who attended Hopkins as an undergraduate in the late 1990s, defeated Jennings last May, winning $2 million more and the title "Ultimate Tournament Champion." We asked the champ: Is winning $3.2 million all that it's cracked up to be? kingworld.com Well, yes and no. Rutter used his original Jeopardy winnings to buy a silver Porsche Boxter S, which he now plans to trade in for a Porsche 911 after his most recent win. However, he lacks the lavish lifestyle one might expect a game show millionaire would have. He lives in a three-bedroom apartment and frequents the sandwich stand at the local farmer's market. On the other hand, the money enabled him to do what he's always wanted: create and host InQuizitive, his own It's Academic-style trivia game show. "I didn't want to get a day job. Now I'm working for myself, and I love working with the kids," says Rutter. He also plans to endow a college scholarship at Manheim Township High School, named for his former Quiz Bowl adviser, Anne Clouser, who died in 2000.